Iran’s aerospace program has been so active in the last few years it should be possible to say something about their development philosophy: the technological arc or trajectory they are following. For instance, why did they “jump” from SCUD-type missiles to the Shahab-3-type? Why didn’t they put a higher priority on clustering engines in order to achieve greater ranges before moving on to the Shahab-3? Many of my friends believe they should have. A large portion of their argument is centered on the fact that they believe Iran would have established a missile capable of hitting Israel much sooner if they had done that, perhaps as early as the mid-1990s. Of course, such arguments place an extraordinary amount of emphasis on such a military objective, especially when Iran’s nuclear program was much, much less advanced. 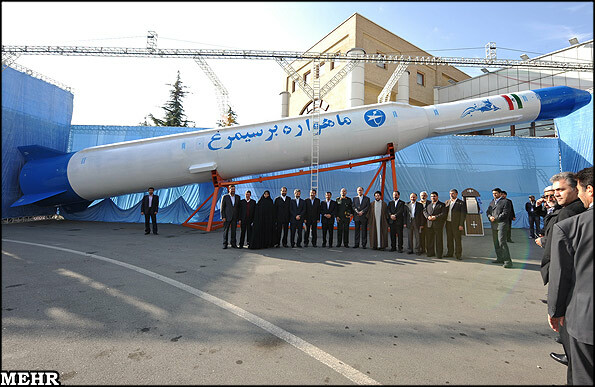 A new, large, two-stage rocket with the Iranian space agency logos on it. The second stage appears to be the same stage (and nose fairing) as the Safir’s second stage. 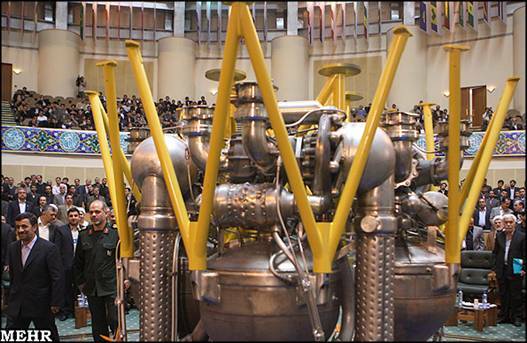 An Iranian rocket scientist unveils the new cluster of four Nodong engines, known as the Phoenix (if Google translate is working properly). The yellow struts above the engines are for transmitting the thrust to the rocket’s airframe. Their presence implies that the first stage will use jet vanes for thrust vector control. Phoenix, the name of the new power plant, is an interesting name. I’m not sure what the Iranian mythological implications are but as a Westerner, to me it means rebirth in fire. Perhaps they are implying the rebirth of this engine design in a new form. Of course, it is always dangerous to use one cultural point of view to analyze another culture’s literary allusions. The yellow struts rising above the engine cluster (and their multiple turbopumps, perhaps four? one for each engine?) are for fastening the power plant to the rocket body and for transmitting the thrust they develop. They are angled slightly outward for increased structural strength. Pads at the top of the struts are the connections with corresponding strong points inside the first stage. But is the first stage wide enough to accommodate this cluster? To answer that question, I have had to go through a chain of photo-interpretation; each of which undoubtedly contributes a certain amount of uncertainty or error to the final answer. First, I had to determine the diameter of the Nodong engine. (I know these are Shahab-3 engines, but I am so used to calling them Nodongs, it would be too painful to switch. Let it be known that I think these engines are indigenously produced in Iran, though Iran probably bought or licensed the production line for them from North Korea.) I get a diameter for the combustion chamber, just below the strong points for the struts, of 0.57 m.
The top of the Phoenix power plant, showing the combustion chambers and the full diameter of the struts. Calculations by the author indicate that this cluster of four engines would certainly fit inside the large rocket body shown above. Using this combustion chamber diameter as a reference point on length, I get a total separation between opposite pads at the top of the struts of 1.87 meters. Of course, a rather long chain of analyses was needed to estimate this length. And even the assumption that the farthest right strut pad and the farthest left strut pad represent the full diameter of the support system introduces a certain amount of uncertainty (though that is reduced by a cosine theta effect). Nevertheless, this is remarkably close to my estimate for the diameter of the new rocket’s first stage. Close enough to convince me that this is the new first stage’s power plant. So what do I think has happened? First, Iran purchased a production line for Nodong engines (and the other components of the Shahab-3 missile) from North Korea. However, though the years of producing them, flight testing Shahabs, and modifying them with the design and production of the Safir and other rockets, Iran has fully assimilated this technology and they are moving on to the next stage of development—clustering large engines (they obviously gained some highly important experience with the cluster of two engines on the Safir’s second stage)— and they are probably doing this largely on their own. Note: a future post will estimate the range of this missile using the “hypothesis” developed here. The base stage seems to be a quad of 4 safir engines kicking at 32 tons each, i.e. 128 tons total, using differential thrusting for steerage; seems easier to implement with four separate turbos. I’m assuming the fuel/ox combo for the first stage is whatever it was for the safir; whether that is scud juice or NTO/kerosene or UDMH I leave to another discussion. With the given value of 85 tons for the stack, we arrive at normative initial acceleration of ~.5 g. So my question, how much room does the stack have for growth? The safir had an initial accel of ~.3 g, if a growth model for the simorgh were to match that, then it is possible that an eventual simorgh variant could mass 98 tons. How much of that would go towards reinforcing the first stage, extended the second stage or adding a third stage is unknowable at this time but it does suggest, especially in light of the ability of the safir+3rd stage kick motor to readily cover the requirement of a 100kg carrier, that current incarnation of the simorgh sc is very much a transitional beast meant for bigger roles. And what is powering the second stage? Is this what was referenced as the 15 ton thrust “control engine”? It probably has to be within that range since the second stage, if burning the same combo as the safir upper stage, has a lower ceiling of 7-8tons. This would imply that the upper ceiling of the base stage is ~78 tons pointing the way to 2nd &or 3rd stage combined mass in the ballpark of 20 tons @ init accel of ~.3g down the road. Is that a ton to LEO, more, less? The simurgh is depicted in Iranian art as a winged creature in the shape of a bird, gigantic enough to carry off an elephant or a whale. The simurgh has teeth. I think they just consider it a nice fitting name, without any deeper meaning. After all, this is already the third Iranian Simorgh. The other two Simorghs are a Il-76-based AWACS and a F-5-derived trainer aircraft. As Azr@el points out, the struts really only imply that it doesnt use gimbaled engines. It will be interesting to see more pictures of the business end of the first stage to help clear this up. Clearly, one of the technological hurdles a program has to overcome when it starts using clustered engines is thrust balancing so they will have already thought about that problem. It could even be argued that the fins represent a way of stopping roll (the Unha-2, which also used a cluster of Nodong engines did not have fins and did, apparently, use jet vanes) while thrust variations handle the pitch and yaw. Of course, even a small amount of rotation very early in the launch, before the fins are effective, would have an enormous effect on the rocket’s trajectory. I wait with baited breath to see more evidence of what exactly Iran is doing about TVC. Either solution will be very informative. , the rocket uses a cluster of four 32 ton engines plus a control engine of 15 tons thrust, giving 143 tons thrust total. I don’t know whether there’s room for any control engine(s), or what they would be using. If they’re using the upper stage engine they apparently used on Safir, they’d need four (with eight nozzles), and it would be hard to pack them in. More details are at the web site of the Iranian Space Agency. What was unveiled was the engineering model of the Simorgh SLV, which uses a new generation of liquid fuel engines and is capable of putting a 100kg payload in 500km orbit, achieving a velocity of 7500 m/s at 500km. The Simorgh engine is composed of four 32 ton engines, for a total thrust of 128 tons. In the first stage, a 15 ton control engine is used in conjunction with the 128 ton engine, for a total thrust of 143 tons. Simorgh can be used in other SLVs in the future to put a 700 kg payload in 1000km orbit. More details are provided on other items of interest as well: English summary. Size comparison between Safir LV and Simorg LV can be detected on one of the posters in the exhibition. It is regrettable though that there are no clear images of this poster. Also note slightly different faring on the Safir – As if it is supposed to carry larger satellite. I assumed they would try to use the upper stage engine of the Safir if they possibly could, which has a twin-nozzle configuration. This is supposed to be the vernier engine of the Soviet RS-27 SLBM. The thrust is in the right range. In the video, someone tells Ahmadinejad that the diameter of the new missile is 2.5 meters. However it might be an inaccurate estimate for the sake of non professional audience (i.e. the president). Hve you noticed something shooting off at a 1 o’clock angle at around 12 seconds into this clip of the Kavoshgar-3? What is it? What I think you are seeing is the shadow of the rocket’s exhaust plume projected onto the low lying cloud (which the rocket just past through; marked by the point where the shadow and the plume intersect). There is (by good fortune) a man standing right next to the missile. I’ve copied him and moved his image onto the missile for a sort of crude check on my calculation. Of course, this is subjective, but I’m more inclined to believe he is just shy of two meters tall than 2.5 meters. To me, the yellow struts look like an assembly/test jig, that may double as an engineering mock-up. (have a close look at the joints with the combustion chamber) As such, it may be misleading to use them to estimate the diameter of the rocket. It would be ok to estimate the diameter if they are in fact an engineering mock-up, but I doubt that they are production components. As far as the 15 ton “control engine”, if it is part of the first stage, where will it go? Inside the cluster of the safir engines? It would have to be scud sized and have the freedom to gimbal, that just doesn’t seem possible with the depicted arrangement, unless in the actually production model the engines are spread further apart to allow a sufficient interstitial gap amongst them. If 143 tons is the base stage thrust, then @ ~.3g init accel the stack has a growth potential of 110 tons GLOW. Considering the fact that the safir orbited its 2nd stage as well as its payload, my thoughts are that 700 kg may be on the small side for 110 ton stack powered by safir first and second stage engines with a third stage. But regardless, 700kg to 1000km leo does however satisfy even the most conservative throw weight requirements for an ICBM. The interesting thing about estimating the rocket diameter the way I have done is that it doesn’t matter if its a scaled down engineering model or not; just whether or not the second stage is the same as the Safir. (and, of course, assuming that the rocket uses the same scale factor everywhere.) So if that is true, the diameter of the actually rocket is about 1.95 meters, regardless of how big this rocket’s diameter is. Of course, by placing the man next to it makes it seem likely that it is a full scale engineering model. First of all: The Kavoshgar-3 obviously was the same unguided rail-launched single-stage rocket-type as Kavoshgar-2 (i think this was a 355mm-diametered Zelzal-1/Iran-130/Nazeat-6H/Saegheh with the warhead supplanted by a recoverable payload-canister); There’s a computer-animation in circulation that seems to indicate a 2-staged rocket, but that clearly differs from the original rocket actually used (e.g. only two sets of fins instead of three, as in the animation). Poor rat, turtle and ‘can of worms’ – that rocket has a rather high acceleration (especially immediately before burnout), so this was certainly a rather uncomfortable ride (if survivable by vertebrates at all). And if the previous pattern of a Kavoshgar-launch always preceding an immediately following Safir-launch persists, then we’ll soon see the Safir-3 putting another ~50kg (i’ve read something about ‘double the weight of Omid’, so this would be around 60kg – i think this may perhaps be within the limits of the Safir IRILV) micro-sat into LEO (recently, there’ve been nebulous hints at something unspecified happening on or around 11. Ferbuary by the iranian government…maybe another satellite-launch?). Next: Considering the ‘Simorgh’ (my guess is that the persian mythical creature of that name is more closely related to Sinbad the Sailor’s ‘Roc’ or the indian ‘Garuda’ than to the greek ‘Phoenix’; Literally ‘a bird strong enough to carry an elephant away’…), i think we shouldn’t exclude the possibility that these are not 1.25/2m, but perhaps 1.5/2.4-2.5m. The latter ratio seems to describe the presented mock-up a lot better in my eyes (and would link the Simorgh more closely to the lower stages of the Eunha/Taep’oDong-B). I’m measuring a length/first-stage-diameter of about 11 and a second-/first-stage-diameter of ~0.6, so we’ve got either a ~22m long 1.25/2m or a ~27m long 1.5/2.4-2.5m missile; And since there has been a length of 27m mentioned in several press articles on that issue plus, as ‘Mac’ pointed out, hints about a 2.5m diameter plus the picture of Simorgh next to Safir (-> see Tal Inbar’s comment) where the Simorgh is approximately 20% longer than the 22m-Safir (and ~2 times as thick), i’d personally tend to adopt the larger figures (this also makes more sense to me with a four-Nodong-engine-cluster, but more on that later). Also, note that the tip of the Simorgh seems to be somewhat more pointed than that of the Safir; If the rounded part of the tip in both cases has the same diameter (aka is identical), then this, too, would point into the 1.5/2.4-2.5m-direction. I must admit that i, at first, too tended more to the 2.0m-figure because of that man standing in front of/beneath that missile, but there are maybe other explanations for this apparent discrepancy. We don’t know his exact body size (although something between 1.6 and 2.0m would be a reasonable assumption). We don’t know if he’s standing directly underneath the missile (which doesn’t seem to be the case, although he obviously is closer to the missile than the rest of the people). We don’t know how far away the camera was, thus it’s rather hard to correctly compensate for perspective (a tricky business in any case). And, last but not least, we also don’t know for sure if this is a 1:1 or a subscale mock-up of the Simorgh (although i’d tend to assume 1:1). Interesting details of the Simorgh-mock-up: 1.) The cable-duct ends at the conical interstage-section, so this would indicate an upper tank bulkhead within that conical section; 2.) There’s a small box (apparently a retro-rocket) fitted to the lower stage intertank-section; 3.) Points number 1.) and 2.) tell us something about the tank-volume-ratio, which would be (internal fuel lines considered, and there are no signs of external ones visible) roughly consistent with IRFNA/Kerosene, and that would fit well with a cluster of NoDong-engines. And 4.) the fins approximately have the right size to be perhaps associated with the NoDong-A-missile (if i assume 2.4-2.5m diameter). Is it possible that that Simorgh-mock-up is related to something C.P.Vick describes as ‘Taep’oDong-2B’? And last: My guess is that the presented four-Nodong-engine-cluster is more or less identical with the Taep’oDong-B first-stage engine-block. Again, i think correctly analyzing photos in this case is rather tricky (never underestimate the distorting effect perspective, oblique angles and/or some kinds of photo-lenses can have). I’m absolutely not 100% sure of this, but based on preliminary analysis of that picture, i’d say that the maximum diameter of the (yellow) thrust frame may be closer to 2.5 than to 1.87m (i’m assuming a thrust-chamber diameter of 0.59m; Oh, and a tip: use one of the retral thrust chambers for scaling purposes, since the one in front is reproduced larger due to perspective!). Nonetheless, we can clearly see that this is no four-chamber-engine (with only one large turbopump), but four distict Nodong-engines, each with its own (small) turbopump (see e.g. the turbine exhaust line next to each chamber). Plus, i think it’s obvious that that assembly differs in a multitude of important details (like the length/form of the turbine exhaust-lines/heat-exchangers, the shutoff-valves, the general pipeworks, the proportions of the thrust chambers, the arrangement of the turbine beside both propellant pumps, not between them, etc. etc. etc.) from the chinese DF-3-engine (as can be seen here: http://www.b14643.de/Spacerockets_1/Diverse/DF-3/YF-2_engine_big.jpg) – the latter (chinese) one seems to be still heavily influenced by (german/russian) Aggregat-4/V-2 technology (especially considering the turbopump and the shutoff-valves), while the Nodong-engine exactly looks like a larger predecessor of the Scud’s Isayev 9D21 (identical arrangement of the turbopump: oxidiser-pump – fuel-pump – turbine, identical general design, but different proportions of the thrust chamber/nozzle resulting in a lower expansion ratio aka a lower design-chamber-pressure than on the newer? Scud-engine). One last thing: until further material on that missile-type surfaces, we shouldn’t overinterpret what we see; If i’m right, then the Iranians don’t have a launchpad for the larger missile yet, so the first launch of a Simorgh may take quite some time (six months? A year? Several years? ), and a lot of features can change from the present configuration till then. You mention “the (yellow) thrust frame” – are you sure that it is the actual thrust frame? I guess that the engine was transported to the council chamber on this jig, which was then inverted for the display. For the reason I posted previously, it may be misleading to use the yellow frame to estimate the diameter of the rocket. Regarding the launch date of the Simorg – Take a look at the NK like launch tower and complex at Semnan – The pictures on GE are from October 2009, so you can see how much additional work is needed. My estimate would be – launch on February 3, 2011 (The second Iranian national day of space industries). I urge you to look on the link I posted hours ago – it will help to see the sizes of Safir and Simurg. Jeff, why don’t you put the image IN THE THREAD? I urge you to put the image in the thread yourself. Other people do. I actually have work of my own to do. That news article was mistaken and retracted, the plane carried unguided rockets and small arms. The unha-2 had a liftoff thrust of 110tons as opposed to 128tons(not counting the “control engine”) for the simorgh. And the simorgh base stage seems to be have a greater length to diameter ratio than the unha-2. Considering the liftoff thrust of the Eunha/Taep’oDong-B: What makes you so sure that this isn’t 128t (or maybe ~124t)? I’m reconstructing/estimating a takeoff-weight of ~82-91t for that missile, while i’m measuring a liftoff-acceleration somewhere between 1.35 and 1.43g – so that leaves a liftoff-thrust-range somewhere between 110 and 130t (unfortunately, the photographic material available to me allows no further restriction, so it’s somewhat inconclusive – but 110t would be exactly equal to the lower limit, while 124t would be close to the mean value of 120t…). I simply wouldn’t exclude the possibility of 4×31-32t-engines on the Eunha. And we likewise don’t know if the iranian 4-engine-cluster is composed of 27t-NoDong- or 31-32t-NoDong+-engines. In case of the Simorgh in the exhibited configuration, i’m estimating a liftoff-weight of ~46-51t (if 1.25/2.0m – i’d earmark that as rather unlikely, since that would result in a liftoff-acceleration of over 2Gs, even with a cluster of four non-uprated NoDong-engines; I’m also skeptical if such an engine-cluster plus a steering system of some sort can fit inside of such a small diameter) or ~88-97t (if 1.5/2.5m), and that would require a sea-level-thrust of ~106-126t for a minimum liftoff-acceleration of 1.2-1.3Gs. On the other hand, i wrote “more or less identical” – and that holds true for a cluster of NoDong-engines in both cases, uprated or not. I’d just find it somewhat curious that two countries with a history of collaboration on the missile sector would invent absolutely similar engine-clusters at about the same time absolutely independent from each other. As an aside note, i’m not sure if rumors about a ‘control-engine’ with a thrust of ~13.6-15t (depending on the source) don’t refer to the upper stage engine instead of a lower-stage vernier engine. The stated thrust would well coincide with that of a standard Scud-engine (sea-level: 13.3t; vacuum: 14.5t), maybe adapted with a nozzle-extension. Of course, i can not be 100% sure that this is the actual thrust frame, but the ‘flaring’ form with flanges on top would make sense to me for such a structure (compare e.g. the thrust frame of the R-17/SS-1c/Scud-B). On the other hand, if this would be only a transport frame, then a) why the cantilevered upper end (not necessary even if a jig for live-fire testing – straight struts would do) and b) why depositing the array ‘upside down’ and let it stand otherwise unsupported on the nozzle ends during the display? Also, don’t forget that the inner strong points of the thrust-chambers have to be supported somehow, too – thus the ‘inner frame’, which probably somehow connects to the (probably accordingly reinforced) lower tank bulkhead, while the four ‘outer frames’ connect directly to a strengthened rib of the airframe. But on one thing i think we both can agree: we simply can’t be sure if this is the real thing, so any dimensional estimate should be taken with a grain of salt. I have a question which perhaps is not directly related to the new Iranian SLV engine. I was wondering, how much the advances in the rocket science and SLV design, would effect/contribute the advencement of other branches of aerospace industry, such as -say jet engine design or aircraft design? Would advancements in the field of rocket technology (and the necessary advencements in the field of material science) have an important implication on the possible advancement in the field of air-craft design or jet engine design? First, please dismiss anything you’ve ever read at strategypage as you would anything you’ve ever read at debka files. Both are aggregates of myth, rumour and fan-boyisms which pollute with wishful thinking and disinformation more than they contribute to the dissemination of knowledge. With respect to the nodong/safir question, I’m of the opinion that the Iranians are running their safir engines on NTO/Kerosene and not scud juice, thus explaining the thrust discrepancy between the 32 tons of the safir and the 27 tons of the NoDong. And I share your suspicion that the 15 ton “control engine” is indeed the second stage engine. However I believe it to be a multi chamber/nozzle design in the fashion of the safir upper stage as opposed to a unitary chamber/nozzle scud. Also I assume it would be running a more energetic fuel/oxidizer combo than the scud juice of the Isayev powerplant. I’m sure most of this will be answered in a short period of time as tal has indicated the stage has already been set at semnan for this to play out in the not so distant future. To answer your question: No. Rocket engines and jet engines are two completely different beasts, as are missile and aircraft airframes (those guys at NASA with their space shuttle would, without doubt, answer this question differently, but i’m skeptical if they even understand the Tsiolkovsky/Oberth-equation and the inherent elegance of tandem-staging…). Even material science doesn’t benefit much from that, since rocket science and even aircraft design typically are no mass applications (as in really big numbers like in automobile production, or, don’t laugh since this is a real-world example, beer cans: at least some of the aluminum alloys used on Boeing aircraft were initially developed for Budweiser…) – so it usually isn’t profitable to develop specialized materials for these particular fields only; Characteristically you choose materials/alloys already developed for other branches from the catalog (so, if you don’t have access to required materials, either the project dies, will offer less performance in the end or you succeed at supplanting those materials with ones available to you). Of course, there are always exceptions to this rule, but that is, well, the exception, not the usual case. Here is the YF2 thrust frame for comparison – however I am not sure that this is the actual YF2 flight frame and not for static tests etc. Possibly off-topic, possibly not, do maraging steels have any particular relevance for rockets of the sort under discussion here? Considering “anything you’ve ever read at strategypage as you would anything you’ve ever read at debka files” (and anything else the media bombards us with), maybe you’re right. It’s at least advisable to remain skeptical on such information. All the more would it be interesting to see photographic material of what exactly was on board of that Ilyushin, since, let’s say, ‘rumors’ of Taep’oDong-B-parts for Iran apparently are still in circulation. Considering your idea of higher thrust by supplanting IRFNA with NTO in a given engine design: Can you please expand on your thoughts? What exactly makes you think that this would result in a higher thrust level? Could you please cite any examples of an NTO/Kerosene-engine? On the ’15 ton control engine’: I’m sure we will sooner or later see what that exactly means (and hopefully, ‘seeing’ also includes understanding what we see). In the meantime, any theory on that issue must be considered purely hypothetic. As i wrote before, we shouldn’t overinterpret the scarce information we have at the moment. BTW, i think a lot of the recently exhibited engine and airframe parts have nothing to do with the Simorgh, but are instead related to the Safir (like examples of the 4D10 vernier-engine or a payload shroud etc.). Well, the DF-3/DF-4-engine and the Burya-booster are the only other non-gimbaled four-engine-clusters i can think of (and yes, i think that is the actual thrust frame of the YF-2 in that photo). But, as i wrote before, the YF-1 (one engine from that four-block) has nothing to do with the Nodong-engine (see especially the differences of the turbopump, the shutoff-valves, the general pipeworks, compare the proportions of the thrust-chambers etc.etc.etc. yadayadayada…if you don’t see the differences – inspect more closely, put more emphasis on details and i’m sure you will agree with me then), or the Burya-engine (i allow myself not to follow Mr. Brügge’s conclusions on that issue), so different solutions by different designers for different engines are definitely a possibility in my eyes. In essence, a thrust-frame is simply a load-bearing framework which has the function of transmitting the force generated by the thrust-chamber into the airframe of the missile (which is more or less a thin-walled tube). Thus, it characteristically has to flare outwards to the top to connect the (smaller-diametered) thrust chamber with the (larger-diametered) missile body (since it might be difficult to fit a thrust-chamber into a smaller missile body). That general characteristic is not compulsory for a test- or transport-rig (but isn’t impossible in this case either). Please note the great diversity of possible engineering solutions for that particular problem (and that is just for american rocket engines!). Good question. Maraging steel would allow building lighter missile bodies, but the effect on missile performance would probably be more pronounced in solid-fueled than liquid-fueled missiles (in solids, the ‘tank’-structure is the thrust-chamber at the same time and thus is confronted by an inside-pressure ~10 times as high, not to mention additional heat-loading). Nonetheless interesting that the Syrians (and North Koreans) are tinkering around with that type of technology. Maybe this is somehow related to the syrian ER-Scud (which i consider to be a perfected iraqi S-100/Al-Abbas)? Here are the two images located by Tal Inbar. Advances in rocketry are not likely to have much direct influence on things like jet engine design, aeronautics, etc. One of the principle reasons for this (for jet engines / gas turbines, at least) is that rockets have lifespans measured in a few hundreds of seconds, whereas the blades of a good jet engine have to last for many hours of flight before being changed. That said, a lot of the “infrastructure” for advanced engineering is common across many disciplines, and I’m sure the Iranian rocketry experience will be relevant to fields like: fluid dynamics, aerodynamics, vibration analysis, high-temperature chemistry, combustion chemistry, (combustion) thermo-acoustics, sensor development, multi-plane balancing, metallurgy, etc, all of which could find application in areas like aircraft design or jet engine design. As far as I know Iran doesn’t actually design its own aircraft or jet engines, but that doesn’t mean that there is no prospect for synergies in its fields of interest. For example, improvements in gas centrifuge performance are also dependent on advanced flow-dynamics codes (e.g. to model the high speed flow around the scoops) so I’d be surprised if developments in rocketry weren’t available in a broad sense also to other areas of interest. As a final thought, nuclear power, bombs, jets and rockets have a certain sexiness about them (at least to me!) that, say, research into advanced springier tennis racquets doesn’t have. So I don’t underestimate the power of Iran’s “strategic” programmes to attract and retain the brightest and best scientists and engineers in the country. One only has to look at the Manhattan project, NASA’s “race to the moon”, or Russia’s parallel projects to see how quickly a large collection of smart, motivated people – feeding off of each other’s ideas – can advance a technology. Thanks a lot for taking your time and answering back. I got the answers I was looking for. By the way, as far as I know Iran is very much interested in Jet engine/gas turbine design. But either because they are not as successful in that field or perhaps because westerners are not that sensitive towards Irans advancements in that field (as yet!!) 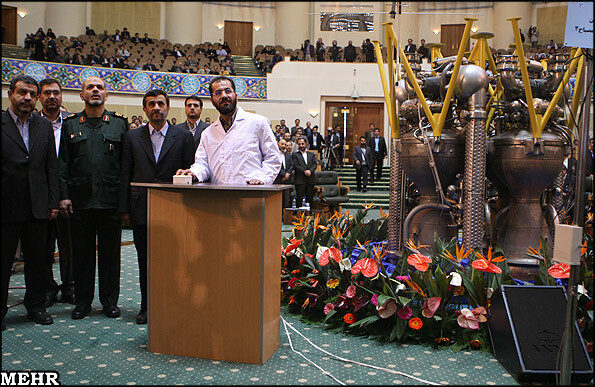 it does not attract as much attention as for example, Iran’s space program. Considering what ‘Hairs’ wrote, i think he’s absolutely right (and i should dilute my categorical ‘no’ somewhat): Rocket science will have little direct influence, but to make this possible, a lot of basic research, probably also measures for general industrial development, will have to be carried out in advance, and that will potentially have an effect on other disciplines, too. Unless you’re actually buying hardware designed and manufactured by others (and this way avoid the need for basic research and general industrial development) – in this case, any effect on the local capabilities will be neglectable. BTW, we should also contemplate rocket science (and aircraft/jet-engine design) a little bit more differentiated. There are relatively simple, easy to master aspects (like the airframe/tank structure in case of missiles) – and then there are highly complex fields (like e.g. rocket engines or guidance systems) almost impossible to cope with without lengthy, agonizingly slow advancing, cashgobbling development programs with many, many tests and an according number of setbacks or professional outside help. There are relatively simple, easy to master aspects (like the airframe/tank structure in case of missiles) – and then there are highly complex fields (like e.g. rocket engines or guidance systems) almost impossible to cope with without lengthy, agonizingly slow advancing, cashgobbling development programs with many, many tests and an according number of setbacks or professional outside help. Rocket engines are easy; very lightweight, high performance (high delivered percentage of theoretical specfic impulse for propellant and operating conditions) are not easy. Sometimes moderate performance is enough. Guidance systems are hard from scratch. Most of the parts are off the shelf now, though, and basic technologies like rolling your own fiber optic gyros and accelerometers aren’t that difficult to master, even without an advanced manufacturing base. Thanks for posting that logo-art. You might be interested to know that what you posted is not only a picture, but also text! It is a stylized way of writing out the word “Simorgh”! A kind of word-painting. By the way, as for the attempts to read meanings to the choice of the word Simorgh: I think one shouldn’t read anything into these choices. If a word is used in myth, literature , poetry, the Qur’an, etc. to refer to an object that is airborne, then it’s a clever name to give a rocket or plane. By the way, Simorgh’s most common cultural connotation in contemporary Iranian culture is not its power or its teeth. It is the mystical symbolism of the bird in Sufi poetry & literature to indicate the unity of all beings with God. You will note that the big bird is carrying a small bird with its beak! In some folktales, Simorgh does that! A very apt image for a satellite career! So, the logo seems to emphasize the function of the rocket as as a satellite carrier. Clever! By the way, it is the tail section of the logo that spells out Simorgh in stylized calligraphy. “Rocket engines are easy” – Then you’ve never tried to layout a turbopump-engine! It may be true that every schoolkid is potentially able to scratchbuild a more or less functional blackpowder-microrocket, but as e.g. the South-Koreans had to find out the hard way, ‘moderate performance’ (as in their pressure-fed LOX/Kerosene KSR-3 engine) is insufficient for high-end-applications (like space transportation). It may be tempting to classify Scud-like technology as ‘moderate performance’ (compared to e.g. closed-cycle LOX/LH2-engines) in this context, but that is not exactly true. This ancient stuff is already too complex to be considered ‘easy to manage’ (at least without professional help). Even pressure-fed engines (and i consider those to be indeed rather mediocre, be that performance or complexity) have their stumbling blocks. And then, there are solid boosters – comparably simple in configuration and thus seductively easy to design (there are more than enough hidden traps to avoid concerning this matter, as e.g. the Indians had to find out). The bottleneck in this case typically is the manufacturing process (especially Q.A.!). But what you wrote about guidance systems probably also applies to engine-technology: Nowadays, a lot of off-the-shelf components, materials and manufacturing technologies are available on the international (black?-)market, as is specialized engineering manpower, so it may be possible to cut some corners. Interesting enough, if we see huge progress in one sector (aka missile program) and not much progress in most others (like jet-engine production, oil refining capability, car engine design etc. ), maybe we can assess that as an indicator of lack of general industrial development (aka some sort of outside help in one particular sector). Thanks for sharing these insights in iranian culture with us. Indeed, this helps with understanding the choice of that particular name. BTW, i think the big bird/small bird style of that logo may possibly be a (rather elegantly placed) reference to the two-staged nature of that missile. Thanks for pointing out all the meaning in the “logo-art.” I thought is was a beautiful design but I like it even more now that I know it has a word(s) contained in it. It’s curious why a few weeks ago Iran was begging Russia, India, Italy to launch its satellites. They all said no to Iran, predictably. Now Iran says they will do it themselves. Phoenix in Farsi is called “Gheghnoos”, Simorgh is different than the Phoenician bird. I heard a rumour the Iranians were caught by a sat stacking a safir liquid upper stage unto a two stage sejjil. Any insight into the performance envelope of a such a chimera? In particular could it make orbit or would it be limited to other functions? I imagine one the first goals of the Iranians would be to get a photo-recce sat up asap. The Israelis have managed a 70cm resolution with their 225kg ofeq 3. The Iranians have already launched a 160kg satellite with a 50 m resolution. The question, can their current optical, electronic, and power industry manage to get a photo-recce bird with a resolution under a meter up under 700kg? How is Italy supposed to launch a satellite? The moon is not exactly a ‘big pizza pie’. Italy has never launched a space satellite, it has never made a space carrier, it in all likely hood never will. Italy has launched a few sounding rockets from an abandoned oil rig off the coast of Somalia in the 60’s or 70’s and has built a few microsats in league with NASA or ESA but that pretty much speaks to the totality of their capabilities. I can’t imagine anyone asking them for a lift up the gravity well. If Iran was to mount a Safir second stage on a Sejil, it would certainly answer (one way or another) the question of that structure’s strength. My guess is that it couldnt stand the acceleration. But it would certainly be enlightening if they tried. Going by the wikipedia article the only thing the simorgh seems to have in common with the phoenix is both being mythical birds. Even though simorgh is present in different folklores as an Iranian I think the references in Attar are the more prominent ones in people’s minds. I also don’t think that a deeper meaning was the focus here. I share the doubts Geoff has about a Safir second stage on top of a Sejjil; That stage has to be built rather lightweight to explain the performance envelope of the Safir IRILV. So the forces and vibration levels associated with solid boosters would likely overstrain that type of upper stage (apart from the fact that the low thrust of that stage probably won’t allow significantly larger payloads, which, too, would have to be hardened against the harsher solid-rocket-conditions at the expense of available mission-mass). But let’s wait and see, since i expect another iranian satellite launch attempt soon (my guess is, though, that this will be the about five months overdue Safir-3). Any questions remaining considering (65%) italian space carriers? If i recall this correctly, then the Mesbah-satellite was designed and built by Thales Alenia Space (ex Alcatel Alenia Space ex Alenia Spazio, as they were called back then), and initially was planned to be launched by them, too (although i’m not sure if that was to be by Vega or on an Ariane-5-microsat-slot or the like). BTW, Azr@el, may i ask you again to please expand on why exactly you think that supplanting IRFNA with NTO would result in a higher thrust level in case of the Nodong-engine? Could you please cite an example of an NTO/Kerosene-engine for comparison purposes? the Mesbah-satellite was designed and built by Carlo Gavazzi Space . In the preliminary desidn it was to be piggyback carried on Ariane 5. But, it was later mated to Cosmos 3M, the same launcher that sent Sina-1 into space. Regarding a Safir second stage on a Sejil, my back-of-the-envelope calculations (literary on the back of an envelope) suggests that in term of exerted g-forces to the Safir’s second stage would be very similar; in fact in the last seconds of Safir’s first stage operation accelaration is equal to about 3.7 g slightly higher than max a of Sejil with 3.45 g.
Thanks for your comments, Tal! I certainly agree with you that all indications are that they are trying to conceal the business end of the rocket. I suspected that from the other pictures which showed a blue screen awkwardly positions so close to the rear end (and that guy standing so conspicuously close to it all by himself) but your pictures are more convincing. Simurgh will be launched from the known Safir launch pad, and NOT from the new complex, a-la-NK. This very distorted frame from a video show a poster depicting the Simurgh on the Safir launch pad. I don’t believe the Iranians have an engine that realizes the optimal ISP of the fuel/ox combo they are employing. Thus I assume that they are utilizing a more energetic combo inefficiently rather than assume, as you have, that they are using a less energetic combo at near maximum efficiency. NTO at 50% with HNO3 has been burned with Kerosene in pressure fed engines such as the OTRAG sounding rocket. I don’t see any particular show stoppers regarding its employment in a straight mix with kerosene as propellant for the safir. It will run hotter and denser thus the greater thrust. It delivers an isp close to cryo propellants without the overhead of refrigeration and insulation, both are dense, relatively inexpensive and storable. And an irfna/kerosene engine can be tweaked to run straight nto without major redesign. This is of course all circumstantial, but given the unexpected performance of the safir, the relative underperformance of the Nodong and my own reluctance to accept that the Iranians have made an uber-efficient engine, I believe the Iranians must be running a higher ISP combo, and nto/kerosene seems the likeliest fit. As far as Italy and the space carrier, seriously, extraordinary claims require extraordinary evidence. Many nations at some time or another endeavor to join the space club; Australia, Argentina, Egypt, Romania, Spain, Germany, South Africa, etc, before giving it up and calling it a day. When Rome pops one up, I’ll stick a feather in my hat and call it macaroni, ‘till then don’t hold your breath waiting for linguine from the heavens shischkal. However Italy does have Vega rocket in development mentioned by JS. To answer my own question, I think Mesbah satellite is kept in storage somewhere in Italy, Italy won’t send it to Iran because of new sanctions. Maybe Iran was trying its luck to get Italy to send the satellite to space, as a way of getting around sanctions! The new Iranian satellite is called Mesbah-2, presumably it’s different than the one made in Italy. Thanks for the correction, i wasn’t sure about that anyways (but was sure that this was an italian firm – Alenia was just the first that came to my mind). Let me confirm to you what you apparently already had guessed for yourself: Solid boosters usually don’t have a constant thrust. How much higher the thrust around burnout will be is difficult to say (this largely depends on the grain geometry), but in large military missiles like the Sejjil, this most likely is a grain with a cylindrical core cavity burning from the inside out (for matters of overall-density, simplicity and heat-management). So, the thrust around burnout may as well be two times (or more) higher than directly after ignition. Also, please mark that acceleration is not the primary limiting factor for a force-bearing structure like a missile’s body – force (in this case thrust and, at lower altitudes, aerodynamic drag) is. You’ve neglected yet another important fact about solid boosters in my eyes: Those things usually generate a lot more violent vibrations (‘noise level’) than liquid-fueled engines (solid propellants aren’t that different from slow-burning explosives!) – unfortunately, in this case the missile-body is identical with the thrust-chamber-wall as well, so there’s not a lot of opportunity for mechanical decoupling (see e.g. the problems of the Ares-I-upper-stage in this regard – maybe not unsolvable, but unavoidable to deal with, and this typically has a cost in form of additional weight). Here (again) are the (cell phone camera?) images spotted by Tal Inbar. Rocket hijab! Who knew that the engines had modesty concerns? Perhaps the Iranians feel that they’ve been revealing too much lately. In honor of Geoff’s role in extracting insights from ground-truth images, let’s call it the Forden Burqa. The pictures are from a TV footage that was uploaded i very poor quality to the internet. Aaaah, Azr@el, now i finally understand where you’re making the mistake! 1.) It’s the fuel-component, not the oxidiser which is the energy carrier. So (completely) oxidising one kilogram of kerosene will always release the same amount of energy, independent from the type of oxidiser, be that AK-27I (~27% NTO/~70 HNO3/~3% water etc. ), ‘AK-50’ (50% NTO/50% HNO3), 100% NTO or exen LOX. What will be different is the overall mass-flow (due to different densities of these oxidisers) and optimum O/F (due to different oxygen-content of different oxidisers) – so this amount of energy will have to heat different amounts of mass (with different compositions), aka the chamber temperature will differ. 2.) According to all documentation available to me, NTO has a lower density than nitric acid (1433kg/m³ opposed to 1504kg/m³ at 298°K) – so supplanting a 27%/70%-IRFNA-mixture (~1470kg/m³ at 298°K – i think the russian-specified figure of ~1600kg/m³ for this stuff is at 273°K) with 100% NTO without changing the fuel will not result in higher but lower overall density. Hotter – yes. Denser – no! b) the O/F will be a sub-optimal ~3.28 instead of the original ~3.42 (value taken from the Scud-B; I think this is slightly fuel-rich to begin with, but not to an extent that would countervail against point a), nonetheless). Thus, we can see that c is proportional to the square root of 2h (of course there are some efficiencies to consider additionally in the real world, but in the name of simplicity, i’ve omitted them; Suffice to say that those would not change the overall picture in a significant way). In this context, h of NTO/Kerosene will be about (1+3.42)/(1+3.28)=1.033 that of AK-27/Kerosene, aka about 3.3% higher (due to the density-difference of the oxidiser-component at the same volume-flow). Thus, the exhaust gas velocity will be only ~1.6% higher. dm/dt will be only 96.8% of the original value, while c will be at about 101.6%. Thus, the new thrust will be 0.968*1.016=0.983 of the original thrust, aka only 26.6t (slight rounding error – this is a more correct value than multiplying the above, rounded figures) instead of the original ~27t – not 31-32t! 5.) Last but not least, i haven’t mentioned the potential cooling difficulties that may be associated with higher chamber-temperatures; These may perhaps require a new-design of the cooling channels and/or a different wall-material, aka a new thrust-chamber. But that is not compulsory in any case, especially if the original thrust chamber already had great reserves in that respect (aka wasn’t thoroughly optimized to begin with). Whatever you do, c(F) will be ~1.6 in a ground-launched rocket engine with an area-ratio of ~10. I guarantee you that you’ll never ever reach anything in the range of over 1.84 by anything you can change influencing c(F) (which would be isentropic exponent ϰ, p-ambient, p-chamber, p-exit and A(e)/A(t); p-a will be constant, and we don’t want to change p-c and A(e)/A(t), so p-e will be similar, too; And since the composition of the combustion species will not differ largely, except for slightly less water, ϰ will also not change significantly). A change of A(t) would neccessitate a complete new-design of the thrust-chamber and the turbopump (and the gas-generator etc.etc.etc. ); Not impossible, but hardly a minimum of redesign-effort, isn’t it? Which leaves only the last variable, chamber pressure. Usually, i would refrain from suggesting using a higher pressure in a given engine-design (see point 5. )), but let’s nonetheless look at what changes would be required to make this possible (if i assume that there are sufficient system-inherent reserves considering cooling, temperature-resistance, pump-cavitation, revolution-speed of the turbopump and pressure-resistance of the chamber, the fuel lines, the turbopump, the gas-generator and possibly also the tanks – like in an early, non-optimized design, which i think the Nodong-engine is; Just look at what the Russians were able to do with the ~15bar ~25-27t A4-engine: the RD-103 of the R-5M/SS-3/Shyster in the end had over 40t SL-thrust at over 24bar p-c). I can (potentially – maybe small detail-improvements would be neccessary in some cases) use the same chamber with the same injector head, the same turbopump, the same gas-generator, the same fuel lines, the same mixture-ratio-regulator and i won’t even need to change the volume-ratio of the tanks. The only neccessary adaptation in principle would be a new thrust/chamber-pressure-regulator – and that would only be a modification (aka an enhancement of the regulated pressure zone), not a re-design. After the thrust regulator is eliminated as a stumbling block, there are now two possibilities how the chamber pressure can be ramped up as far as i see: Either by a higher pressure-ratio of the turbopump (aka a higher rotation speed – but there are risks considering maximum tolerable rotation speed and pump-cavitation if employed exclusively) or a higher entry-pressure of the propellants into the turbopump at a given rotation speed (aka higher tank pressure aka more pressure-gas – there’s a risk of the tanks and/or the fuel lines not being able to fully tolerate this, but that is comparably small due to the fact that the missile-body will have to be over-dimensioned strength-wise anyways to act as load-bearing structure, while the fuel lines easily are reinforced). If i’d have to bet, then i’d bet on the pressure-gas-method, probably also in combination with a moderately ramped-up turbopump-speed. I hope i did successfully explain this point. Sorry ‘bout the length of this comment, but complex context is hard to sufficiently dissect in short. Let me say that i could also have chosen a different approach (using different, more complicated formulas and more arcane physical characteristics – there’s more than one way to skin this cat), but i think it should be more easy to understand this way. After looking at that picture, i must say that (mostly due to the unfortunately low quality) i’m skeptical if this depicts the Safir-launch-tower (which is being tilted back hydraulically during launch, while the structure in that poster obviously stands vertical up) or a north-korean-style fixed tower instead. Considering the fact that the Simorgh will have at least 2 times, more likely 3-4 times the liftoff mass of the Safir, a larger diameter, probably 20% greater length and four times the thrust, i’d earmark it as highly unlikely that those two missiles will use the same launch stool, umbilical tower and thrust deflector (aka launchpad). Also, the large mass of the Simorgh will probably neccessitate additionally fueling of both stages after erection/stacking (i think the Safir lower stage is Scud/Shahab-3/Ghadr-1-style already replenished before erection, save the start-up-fuel, only the upper stage with the temperature-sensitive NTO is fueled via the umbilical tower later on). A north-korean-style fixed tower with retractable platforms, differently spaced as on the Safir-tower, a large underground thrust-deflector chute and a crane on top (for hoisting the empty stages separately) might come in more handy in this case. Let’s also not forget that sometimes, a poster is only a poster, nothing more. I am sure we will sooner or later find out about the actual launch infrastructure of the Simorgh (my guess is, though, that this will be rather later than sooner; I project at least a year of intensive construction work, possibly even longer, if i’m right with this T’ongCh’ang-Dong/PongDong-Ni-style launch tower). For the FIRST time – the rear view of Simurg showing the engines configuration. Editors note: I have zoomed in on the rear of the Simorgh in the picture Tal Inbar links to. It seems as if the veil has been lifted on the rear of the Simorgh launch vehicle. One interesting feature is the 90 rotation between the engines and the fins, the usual place for mounting jet vane actuators. This could imply a number of things, including that this “rocket” is more a mock up than perhaps we thought. On the other hand, it could imply something other than a “normal” placing of jet vane actuators (which are just not shown) or some other mechanism for thrust vector control. I dont see, however, any controllable flaps on the fins that I would expect if they were being used for controlling roll while thrust balance was used for pitch and yaw. All in all, it raises more questions but at least we have seen it. a) 4 engines on the base stage, no 15 ton “control engine” on the base stage, that must have been a reference to the upper stage motor. b) TVC via differential thrust throttling. The image shows no sign of steering or any room for verniers. It’s so far from realistic as to suggest it’s a poor mockup. Measuring the diameter across the horizontal nozzles gives a diameter of 45 mm on my screen, with the left nozzle being 14 mm and the right 15 mm. If the nozzles are 0.6 meters in diameter, this would give an overall diameter of no more than 2 meters at the base. This is more consistent with jet vane control, since there’s no room for verniers. The separation of the nozzles doesn’t seem to be the same (larger upper right separation than the other two visible). I can only remind you all again that we should not overinterpret this particular article. This is in all likelihood only an apparently rather crude mock-up, e.g. there are no openings for the four turbopump exhaust-lines, no visible signs of any steering system, and i can’t find any intertank-section or -bulkhead on the quite featureless upper stage. I’m also missing any kind of staging-related details and i consider the length of the second-stage cable duct to be inconsistent. Please note that if i’d try to fit the engine-assembly from that presentation into the back end of that ‘missile’ according to the position and apparent size of the nozzle-openings, then the thrust-frame (or parts of the turbopumps) would not fit within the body (which would then only have a diameter of ~1.8m). I am sure the Iranians will sooner or later show us the real thing (but don’t bet on a short timeframe like in days or weeks, maybe even months) – and it remains to be seen to what extent that will differ from what we’re shown now. Regarding the solid rockets “noise”, do you have an example of how big is the magnitude of these noises? Well I would say it’s likely that the upper stage is more or less a shortened R-27 SERB. If thats the case they made a big jump forward. Could this ‘new’ (from the color of that exhibit, i’d bet on that this chamber already has been ground-tested in the past) thrust-chamber (note the rather similar pivots for the gimbaling frame to those found on the R-27’s vernier-engine!) perhaps be associated with the vernier-engine of the R-29/Vysota/SS-N-8/Sawfly or the R-29R/Volna/SS-N-18/Stingray? Considering that all iranian liquid-fueled rocket engines so far are of Isayev-heritage (the Scud-B’s 9D21, the Nodong-engine, the R-27’s vernier-engine, the Guideline-B’s S2.711), this would seem logical to me. My guess is that, at a reconstructed sea-level-thrust of ~60t for the R-29, the share of the (two-chamber, according to my sources – just like the ~1.5-fold smaller-dimensioned R-27-vernier) vernier-part would be around 11-12% of that thrust, aka ~6.6-7.2t. So four chambers (aka two two-chamber-engines) would deliver a SL-thrust in the range of ~13.6t and ~15t in vacuum – which could be consistent with the iranian information on the Simorgh’s ‘control engine’. Also, such a thrust-level could be consistent with the Simorgh-upper-stage’s weight of an estimated 12-14t (if the 1.5m-diameter should turn out to be correct). Does anybody have photos or verified/verifiable data on the vernier-parts of the Isayev 4D75 (R-29 lower stage) and 4D76 (R-29 upper stage)? There seems to be nothing in this respect available on the ‘net! BTW, please note that, while i think Mr. Brügge does excellent work in respect to raw-data-collection, i disagree with his theory on the lower stage of the Eunha/Taep’oDong-B being a DF-3 (and some of his other conclusions). The exhaust trail of the Eunha-2 definitely more closely resembles a cluster of Nodong-engines (look e.g. at the brown-black soot at the base of the missile’s flame – an effect created by kerosene-film-cooling; This effect can be observed in both the Scud- and the Nodong-engines, but neither on the DF-3 nor the DF-4!) than that of the YF-2. So, in all likelihood, Eunha/Taep’oDong-B and Simorgh (if it’s really the cluster from that presentation) do use the same (or at least a similar) 4-Nodong-engine-cluster. The R-27’s main powerplant is rated at 23 tons-f at sea level with a nominal sea level ISP of ~274. Either the safir engines they are employing exceed that ISP or why aren’t they using R-27 main engines on the base stage? AS far as the upper stage, 23 tons-f seems excessive and the R-27 main would have to undergo extension of of its nozzle to efficiently operate in near vacuum. I think the rocket shown in Tal’s image can’t be the real rocket.The engine consists of 4 Safir engines so it needs 4 more holes for the exhaust of the turbopump. 14 he was on IRIB2 and explained a little about the rocket.He said “For guidance it(rocket) uses 4 other (I think gimbaled thrust) engines to guide the rocket“I think It would be like soyuz. By the way is it just me or does the Simorgh drawing even include the writing Simorgh in Arabic script? You’re right,but call it Farsi script ‘cause Arabs don’t have Simorgh in their mythology.They have Ghoghnous or Angha which means Phoenix.